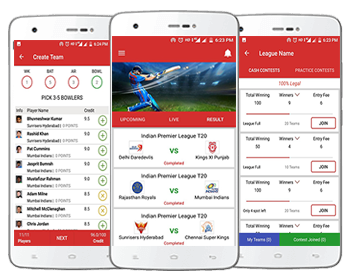 We create fantasy platform for Football and Cricket, we having native app with robust backend panel. For more detailing contact us. "Offer Unmatched Quality Experience to Your Users with Our Fantasy Cricket Apps!" We are known globally for providing white label fantasy sports solution. Irrespective of your specialization in sports, our experts provide you with modern, secure and attractive mobile fantasy sports applications. Billions of dollars fantasy sports gaming market is inviting investors to become an active part of this growing industry. Every now and then cricket, football and other games are organized in any corner of the world that make gaming enthusiasts passionate. To take their spirit for the gaming more exciting and passion ting, fantasy sports are the best alternative. We are a global leader in fantasy website design and development, providing a custom solution to the virtual game. We are specialized in creating your dreamed fantasy cricket and football application. We listen to you and our team of experts works on your creative ideas. We maintain professionalism by providing work on time. There are lots of reasons for getting fantasy sports app development services from us. IF you are you looking to create your fantasy cricket and football fantasy software. Connect with us to get the best quality services at affordable prices. We are mastered in creating daily fantasy sports software and other sports apps like IPL fantasy league app. As you know football is one of the most famous games in the world. The famous FIFA World Cup is watched by over 3 billion people worldwide which give an ultimate opportunity to investors to promote their brands and raise awareness of their products through fantasy football software. It is a wonderful opportunity to connect with your existed and prospective clients. For a spectacular start, you can connect with us. We are a prominent fantasy game developer and have worked on many fantasy football boards. Once you connect with us this is our responsibility to successfully launch your well-functional fantasy football App. What are Top Features Hold by the Gaming App? Users on their platform can able to select the contest by using the fixtures and filters. The app gives an easy access to the following game you want to filter. The software will be comprehensive and appealing. In the feature. the leader will keep an eye on user’s performance and compare your performance to the other users. Users can have their own platform to see the ongoing leagues to select the one in which they want to participate. In order to make the live fantasy football draft board more engaging and interesting, the app will have the feature to invite friends to their private leagues. To encourage users to play the virtual game, again and again, there will be an achievement badge feature. The badge is provided to the users who will perform better in the game. To maintain the trust level of users, the virtual wallet management feature will be added to know deposits, withdrawals, earning and transactions.